To answer questions from people looking for accommodations and budget hotels near Manila Airport (officially Ninoy Aquino International Airport (NAIA)) to stay at for those who who have to wait for connecting flights or just to be comfortable striking distance from NAIA. Note that the word "near" is relative and needs to be defined first for it to be used in this post and will not answer questions on "how far is this hotel" from the airport kind of thing. Tutubi will just use approximate travel time, not absolute distance from the airport terminals as reference. Guide to Sleeping at Airports or near them? The nearest hotel to NAIA Terminal 1 (International Airport) is located inside the airport terminal, on the fourth floor Terminal 1 beside Sampaguita lounge. Each of the twelve air-conditioned hotel rooms measures 3x3 meters, with double beds and private shower and toilet and can be had a room rate of US$19.00 (about PhP840.00) for 24 hours stay. The nearest hotels to NAIA Terminal 3 are luxury Marriott Hotel, Maxim's Hotel, Remington Hotel and Belmont condotel and the planned Hamilton Hotel inside the spanking Newport City opposite the terminal on Andrew's Avenue. It's also very near to the other airport terminals. The nearest hotel to NAIA Terminal 2 used to be the government-owned Philippine Village Hotel but is closed indefinitely. Hotels in Mandaluyong City e.g. Go Hotel (EDSA beside Forum Robinsons Pioneer), Richville Hotel (EDSA near Crossing/Shaw Blvd), New Horizon Hotel (EDSA corner Boni Avenue), EDSA Shangri-la Hotel (beside SM Megamall), Lancaster Hotel (Shaw Blvd), The Legend Villas (Pioneer St.) and Nice Hotel EDSA Crossing. 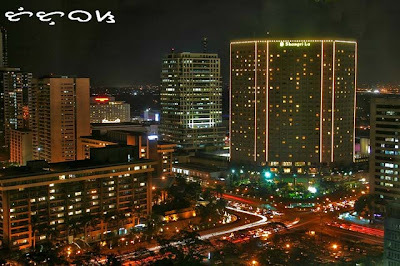 Hotels in Pasig City Ortigas Center e.g. Discovery Suites, Linden Suites Hotel, Richmonde Plaza Hotel (San Miguel Avenue), Astoria Plaza (Jose Maria Escriva Drive), budget-friendly Tune Hotels on Shaw Boulevard near EDSA Crossing. No information on the cheapest room rates available. Please visit official websites for inquiries and reservations. Travel time is based on taxi travel from the airport and will be much less on lean times i.e. late night, dawn and early mornings. This site does not offer online booking nor promo room rates, it's just a rough guide to hotels near Manila airport for your reference so as not to be misled by other websites on the distance of your chosen hotel from your airport disregarding practical travel times and normal traffic situations. I thought this site is about backpacking ? What about economic places to stay like Malate Penisone, maybe Tropicana etc ? Don't think Shangri La Makati is a place for backpackers. does camp crame really has a dorm for rent?what would be the estimated travel time if we travel at around 4am? hi, have a houses and apartments for sale or lease, where the very popular video scandal of a certain media personality was recorded. utilities and association dues will be covered, free wifi internet and bottomless beer available on request. thanks! please help me on how to apply in maxim hotel for a job lyk waiter bartender near at the naia airport minala. private rooms with 8 rates from P300 to P950(U$6+ to U$22 )and U$4 bedspaces only 2.6 km from NAIA 1 Domestic & Centennial2 and 4km from NAIA3 more less a 30 minute walk away. 24 hour check-in and airport service http://www.townhousehotelmanila.com Open since January 1986. Good day! Our flight will be on sunday. I want to know if there is a parking area at terminal 1 and if there is how much will i pay for 7 days? i'm also looking for a hostel or an inn near terminal 1 to spend a night before my travel... please suggest if there is. Many thanks. One of the better, cheaper hotels is located in metropolitan Avenue called the El Rico. I have stayed there twice and when i return I shall stay there again. The rooms are reasonable in price, usually about 1,400 php per night for a double, that is large clean and very tidy, We have a large bedroom, a lounge and shower/ toilet combined. There was a CTV with usual cable channels, as well as free wifi in the hotel Lobby. There is an armed guard on the door 24hours a day and theye are very helpful. The taxi fare to and from the hotel to the port and also the the airport is no more than 250 php. The hotel will organise a good taxi driver when you check out or if you are travelling around. There is lots to do, go round the corner and ask for " Nido " the tricycle driver. he will take you on an informative tour for 100 pesos. there are num,erous eating houses in the region, But the best by far is the Bacolod chicken Express, right by the Tricyle stand ! Enjoy the stay I always do !!!! Hello: I will be arriving NAIA (United) in a couple weeks on a tight budget. How will I get to Alabang (TownCenter Mall) via commute from the Airport. I know my way from Alabang, to my destination. another piece of useful information. Thanks for that !